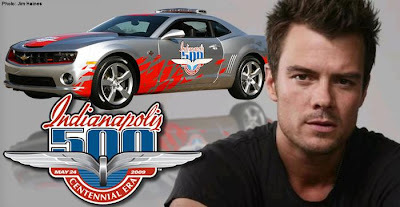 The Indianapolis Motor Speedway announced today that actor and husband of Black Eyed Peas singer Fergie, Josh Duhamel will pace the 93rd Indy 500. The star of Transformers and NBC's Las Vegas will be piloting the 2010 Camaro for the opening warm-up laps of the Greatest Spectacle in Racing. Duhamel also drives a 2010 Camaro in the film Tranformers: Revenge of the fallen, as well as a 1969 Chevy Camaro on the hit TV Show Las Vegas.